A Border Collie on the loose in the 500 block of First Street led to his owner being given a written warning. A resident reported the unauthorized use of a credit card number by an unknown person. A dispute between a landlord and the tenant in the 1000 block of Seventh Street was mediated by the officer. Police responded to Berthoud Elementary School to assist with a physical disturbance caused by an out of control child. A 12-year-old Longmont male was issued a citation charging Juvenile Delinquency (3 counts of assault) and transported for a mental health check. Police investigated the report of a dog bite in the Hillsdale Subdivision. The owner was cited. Josephine Shisler: Failure to keep dog under restraint, vicious dog, unlicensed dog, failure to display rabies tag. A loose Boxer (dog) on Bunyan Court was picked up by the Larimer County Humane Society. Police were on their way to cite a motorcycle parked on the sidewalk by the Subway, but it was gone before they arrived. A Jay Place resident reported credit card fraud. Police stopped to talk to two men walking down Mountain Avenue at 12:37 a.m.
Police decided that the tipped over gravel trailer on Welch Avenue was not a motor vehicle accident and did not need police involvement. There was no answer at the door in the 500 block of Mayo Court when the officer responded to a barking dog complaint. He left his calling card. Responding to a call of suspicious activity at two minutes past midnight, the officer found fishing line across the road on Spartan Avenue. Upon returning home at 1:30 a.m., residents in the 800 block of Bruce Drive found an intoxicated man sleeping on their couch. A 31-year-old Berthoud resident was charged with second-degree criminal trespass and criminal mischief in the incident. A caller reported an hit-and-run on U.S. Highway 287. A report is to follow. A minor parking lot accident at the Berthoud Wine and Spirits led to some heated words and the police were called to the 200 block of Mountain Avenue to intervene. Police stopped to assist a motorist whose engine had overheated at the Kwik Korner. Police are investigating a possible restraining order violation that occurred in the 200 block of Welch Avenue. A Longmont resident was cited for careless driving following a non-injury motor vehicle accident at the intersection of Highway 56 and U.S. Highway 287. A driver was cited after a minor accident in the Hays Market parking lot. John M. Robinett: Violation of limits on backing. The kids in the alley on East Iowa Avenue at 2 a.m. managed to disappear before police arrived. A reported burglary and theft in the 200 block of Second Street was subsequently canceled by the complainant. A yellow Lab running loose at Turner Middle School managed to be gone when police arrived. Police investigated an “awful smell coming from the garage” in the 600 block of Fifth Street. The officer determined that the odor indicated a recent visit by a skunk. Berthoud police had one business assist, one ambulance assist and three assists to the Larimer County Sheriff’s Deputies at the scene of motor vehicle accidents. The police had their own accident to handle on U.S. Highway 287. Police received a complaint about a house on Fourth Street having trash in the back yard. The house is in foreclosure and is vacant so no immediate solution is available. Juveniles were hanging out behind the Pizza Hut, but left before police arrived. A high school student reported the theft of an Ipod. A barking dog in the 1200 block of Aspen Drive was handled by the officer. Police had a talk with the kids hanging out behind the Pizza Hut at 2 p.m.
A resident in the 1000 block of Third Street reported that he was missing a large quantity of wood and assumed that it had been stolen. In late afternoon, dispatch received a report that juveniles near the Turner Middle School were shooting at other juveniles with a paint ball gun. Police did not find anyone who fit the description. A man and a woman were reportedly having a verbal disturbance, perhaps while walking, in the 100 block Mountain Avenue. They were gone by the time police arrived. Graffiti was found in Berthoud Park. Juveniles behind Pizza Hut around noon were given a verbal warning by a police officer. The vehicle parked at Berthoud Park with its radio volume on high was gone when police arrived. A Dachshund captured at Longview Avenue and Greenwood Drive was sent to the Larimer County Humane Society. The barking dog on Bristlecone Court was quiet when police arrived. A Police officer visited three barking dogs in the back yard on Marshall Place shortly after 8 a.m. He returned to the residence at 10:30 a.m. and issued a verbal warning to the dogs and to their person. An officer responded to a complaint of trash in the yard on Jay Place, but did not issue a warning. Residents in the 1200 block of Cedar Drive reported a freezer missing and presumably stolen. Worried parents in the 800 block of Tenth Street reported that their two children were missing and had perhaps run away. The girls were subsequently found by the parents. An argument between two former lovers was loud enough that police responded to a verbal disturbance in the 300 block of Sixth Street. An alert caller reported a juvenile at Turner Middle School. It was, in fact, a young adult who was setting up for volleyball play in the gymnasium. A noise complaint brought the police to the Subway Restaurant shortly after 10 p.m. There was a loud party going on and the officer issued a verbal warning to the revelers. Police went to the 100 block of East Nebraska at 12:40 a.m and apprehended three juveniles who were in possession of and consuming alcoholic beverage. Two boys were from Berthoud and one from Loveland. The Loveland youth was also charged with possession of drug paraphernalia. There were three riderless horses in Greenlawn Cemetery at 8 a.m. The situatuation is listed as being handled by the officer. A dog was reported chasing cars on Highway 56 east of town. He apparently did not try to chase the police car when it arrived and is listed as being gone. A case of attempted burglary and criminal mischief occurred in the 400 block of Third Street. Juveniles fighting in the 100 block of South Third Street brought a response from the police. The officer apparently calmed the situation. In a case of vandalism, a window was reported broken in the 400 block of Third Street. A case of drunkenness was reported at the Pizza Hut in the evening. An individual was harassing the staff according to the caller. Police responded and ended up giving a ride home to an individual who apparently was not the person referred to in the complaint. Shortly after midnight, Police responded to a case of drunkenness in the 200 block of Second Street. There was no space available at the De-Tox center so the officer handled the situation in house. A party called from the Berthoud Wine and Spirits at 7:58 a.m. and said he had been assaulted, but his story could not be verified. He was transported to McKee Medical Center. The couple arguing in the 300 block of Sixth Street on Saturday had still not reconciled their differences. He came to the police station to report that she was harassing him. It turned out that she had been calling him to make arrangement to get her belongings and he refused to answer the phone. Therefore, she kept calling. He reported harassment based on the number of times she had called. The officer thought otherwise and told him her actions did not constitute harassment. Residents on Redwood Circle reported a dog bite, but police were unable to locate the animal. A wallet was turned into the police who returned it to the owner. It was almost 11 p.m. when a resident on Columbine Circle complained of a loud noise from a parked vehicle, but all was quiet when police arrived. A person found a child on north Fourth Street. As it turned out, the child was in front of his own house and had walked out the front door just as his mother came in from the back yard. All were reunited. A caller from the 800 block of Ninth Street reported hearing an adult yelling and a child crying. Police were unable to locate any disturbance. A written warning was issued to a dog owner in the 300 block of South Eighth Street when a neighbor reported that his dog ran out at her while he was walking her dog. A Doberman being walked without a leash along Lake Avenue and Seventh Street was gone when police arrived. The report of a possible fight between juveniles in Berthoud Park is listed as unfounded. A motor vehicle accident at First Street and Welch Avenue did not cause injury. The car with the loud radio playing at Berthoud Park was gone when police arrived. A loose Black Labrador Retriever was gone when police arrived in the 900 block of Kansas Avenue. Another loud car radio, this one reported at Munson Court and South Eighth Street, was also quiet when police arrived. A lost dog was reported. It is a black and white Heeler. Police did a welfare check in the 800 block of Massachusetts Avenue for a child who did not show up at school. The child had the flu. A juvenile in the 400 block of Redwood Circle was bitten while playing with dogs. No citation was issued. The officer issued a verbal warning to the operator of a car that was parked on the sidewalk at Mr. B’s Body Shop. A burglary reported in the 400 block of Indiana Avenue is under active investigation. A resident in the 300 block of East Iowa Avenue saw someone by her car at 3 a.m. and called police. The suspect was gone when police arrived. A missing person with Alzheimer disease was found. A vehicle trespass in the 300 block of East Michigan Avenue is under investigation. Items were missing from the car. A vehicle trespass in the 100 block of East Iowa Avenue is under investigation. A solicitor in the 100 block of East Indiana had a permit. An officer contacted a suspicious vehicle in the 200 block of Mountain Avenue. He issued a Proof of Service to the driver advising the driver that his license was suspended. Free running dogs captured on Sixth Street Court were returned to the owner. Part of a dead animal was fond at First Street and East Michigan Avenue. A small dog at large (a brown Chihuahua) was captured in the 900 block of Seventh Street and turned over to the Larimer County Humane Society. A resident in the 400 block of Bunyan Avenue found drug paraphernalia in the yard. A Welch Avenue complained that a neighbor had put trash in her receptacle. Police determined that he had put his trash in his own trash can. When police interceded in a verbal disturbance between a father and son in the 400 block of Indiana Avenue, the two men agreed to stay away from each other. Roommates in the 400 block of Colorado were so loud in their argument that the police became involved. Juveniles with fireworks were reported in the area of Berthoud Park and Swimming Pool. Police were unable to locate the kids. A motor vehicle accident at Berthoud High School caused property damage only. However, a 16-year-old Berthoud female was issued a citation for careless driving, leaving the scene of an accident without reporting and failed to provide proof of insurance. Items were stolen from a vehicle in the 300 block of East Colorado Avenue. The case is under investigation. A party with an outstanding warrant turned themselves in. Police are investigating vehicle trespasses in the 200 block of East Colorado Avenue, the 300 block of East Colorado Avenue and the 200 bock of East Michigan Avenue. Shawn Michael Riddell, a 45-year-old Weld County Resident was arrested in the 500 block of Fourth Street and charged with Violation of a Protection Order and Domestic Violence. Police responded to a single-vehicle accident in the 1700 block of State Highway 56. A truck pulling a trailer blew off the road and damaged a fence. There were no injuries. A Burglar Alarm at Guaranty Bank at 10:10 p.m. was a false alarm. A person at the Subway restaurant reported that items may have been taken from their backpack. Police received a call from a distraught mother saying that her son had been injured in a fight at Fickel Park and she was going to the park. The officer tried to dissuade her, to no avail. By the time the police arrived mom was already there. The officer calmed everyone down and cautioned kids and parents. The boys involved were 10 and 11-years-old. A woman’s wallet was found and turned in to the police department. Police investigated a “cold” disturbance in the 400 block of Indiana Avenue. Apparently a disagreement between father and son. Police are waiting for an arrest warrant in the theft of a motorcycle in the 400 block of Indiana Avenue. Police arrested Daniel James Guggenheim III, a 32-year-old Berthoud resident at Third Street and Welch Avenue. Guggenheim was charged with Driving under the Influence of Alcohol, Driving while Driver’s License Suspended, No Proof of Insurance and Possession of Drug Paraphernalia. Most of the traffic stops during the day resulted in the motorists receiving verbal warnings. A resident in the 700 block of Second Street reported items missing from their vehicle. A resident in the 100 block of Third Street became concerned when a vehicle drove by with a camera in evidence. A resident in the north part of town reported a suspicious vehicle parked in the area. Meanwhile, another suspicious circumstance was reported by a person in the 1000 block of Third Street who reported a person outside the window at 9:25 p.m.
Police investigated a report that marijuana plants were being grown in a warehouse space in the 700 block of Second Street. The report turned out to be true and police issued a warning and the plants were moved out. A noise complaint from the 500 block of Mount Massive Street was cars revving up their engines. The revvers were given a verbal warning by the responding officer. Police made ten traffic stops and issued three citations. Margaret Ann Essig: Failed to Stop at Stop Sign. Police received a report of the theft of a vehicle license plate in the 200 block of Mountain Avenue. A 17-year-old Larimer County Resident was charged with Careless Driving resulting in Bodily Injury after an accident at the high school involving his car and a bicycle. After several attempts to locate him, Berthoud Police arrested Dale Alan Dardano, a 62-year-old Berthoud resident on a warrant charging Failure to Appear in court concerning Driving While Ability Impaired. Dardano also had the motorcycle which was reported stolen in he 400 block of Indiana Avenue. He said he owned it jointly with his son. The son had been the one who reported it stolen. Police cited a 16-year-old male Berthoud resident in the 300 block of Seventh Avenue for Possession of Marijuana and possession of Drug Paraphernalia. Noel K. Lebsack, a 20-year-old Berthoud resident was charged with Thefts and 1st Degree Criminal Trespass for numerous incidents in Mary’s Farm the previous few days. A vehicle in the 300 block of E Colorado Avenue was entered and items taken. A respondent in the 700 block of Sixth Street reported being threatened, but there was no evidence to back up his complaint. Laurie A. Grubl, a 49-year-old Berthoud resident was arrested in the 1300 block of Fourth Street and charged with Harassment and Obstructing of Telephone Service. The charges are related to Domestic Violence. Police filed additional charges against Noel K Lebsak in the thefts and vehicle trespasses in Mary’s Farm. Police received a report from a Mary’s Farm resident who just discovered their vehicle had been entered. Note: The police still have unclaimed items, likely from residents who are unaware that their vehicles have been robbed. The Chihuahua dogs were in the street at Third and Franklin, but police were unable to locate the small canines. An Elm Drive resident reported a woman in the yard with a dog and a baby. No one was there when police arrived. .
A caller reported that he thought he saw a drug deal in Berthoud Park, but the suspects were gone when police arrived. Police handled a Restraining Order Violation in the 1300 block of Fourth Street. Apparently the restrained person contacted a “Third Party” who was not aware that third party contact was prohibited. A woman walking her dogs near the high school reported that two Black Labs were “harassing” her and her dogs. The Labs had left by the time police arrived. An unlicensed trailer parked on Colorado Avenue brought a visit from a Berthoud Police officer. Police investigated a case of trash being dumped by County Road 7. Cows on the road on South County Road 17 near Spartan Avenue is listed as a traffic hazard. However, they cows had departed before the police arrived. 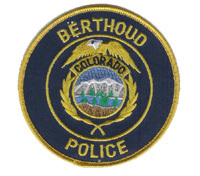 A .22 magnum cartridge was found on the floor of a hallway at Berthoud High School. A Colorado Avenue resident called in suspicious activity when a man knocked on the door. A man came to the Police Department with questions about harassment. Juveniles in the area of South Fifth Street and Nebraska Avenue ran from the police officer. It was almost 1 a.m. and certainly past curfew. The same thing happened again at 2:22 a.m. when the officer attempted to make contact with a juvenile pedestrian in the same area. A resident of the 100 block of East Nebraska Avenue reported the theft of yard signs. Police arrested a Pit Bull puppy in the 900 block of Mountain Avenue. The puppy had a collar, but there were no tags on the collar. The puppy was remanded to the custody of the Larimer County Humane Society. Police captured two Black Labs in the 800 block of Fourth Street. Previous Story: Evacuation Area Open to Residents at 10:00 a.m.